I've always been an overthinker and prone to worrying about everything. I've been that way for as long as I can remember, but no one ever knew that about me because I'm pretty reserved and keep a lot bottled inside. Fast forward to 2013, when I became pregnant with my daughter, Nailah. Throughout the pregnancy, my husband, Chris, and I discussed our new roles and responsibilities. He usually works six to seven days a week, up to 12 hours a night, and I work from home. So, we agreed that I would continue doing most of the cleaning and cooking, he would help out more around the house, and, of course, we would both do our share when it came to taking care of the baby. As you can probably guess from the fact that you're reading this (and that Black Girl's Guide to Calm exists), things did not go according to plan. In addition to dealing with a little postpartum depression and having trouble breastfeeding initially (which was quite frustrating until Nailah and I got it together), I was trying to find harmony between learning how to be a mother, trying to be a good wife while also getting back to business and taking care of home. When Chris went back to work, he was back on seven nights and 12 hour shifts, so there wasn't a whole lot of help on his end. Not only was I frustrated and disappointed by the lack of assistance and not really having time to myself, I also felt guilty for needing help, especially since Chris was working hard to provide for us. Plus, I felt like this whole motherhood thing should've been easier and that I should just know what to do (I mean, doesn't everyone say it comes naturally? – but I digress). A few months into this new journey of motherhood, the tension between Chris and I was super thick, and the only time we really talked was to get answers or relay information: “What do you need from the store?” “Dinner's ready.” “Can you get Nailah?” While I was tired of feeling the way I did and of things being the way they were, I hadn't really made an effort to do anything about it. On some level, I think I liked being mad because I felt like I was justified in feeling that way – even though that mentality wasn't healthy for me or my relationship. Ultimately, Chris asked me a question, which was the straw that broke the camel's back: He asked me if I still wanted to be with him. Talk about a wake-up call. Yeah, I was frustrated. Sure, I was miserable and not the happiest. But I love(d) him and definitely didn't want to leave. At that moment, I knew it was time to do something different. One of the first things I did was read articles and blog posts about how to improve my marriage, and what I came to realize is that to change any relationship that needs repairing, you have to work on you because obviously, that's the only person you can change. That was a bitter pill to swallow, but I decided to work on myself by writing some new affirmations around how I wanted to feel, journaling more regularly, and making a sincere effort to have a more positive attitude. And probably most importantly, I communicated what I needed (note: people aren't mind readers; you have to be clear about what you need and desire) so I could actually start prioritizing and taking care of myself. I'd also been doing pilates and yoga at the time, and those activities led me to re-starting my meditation practice. 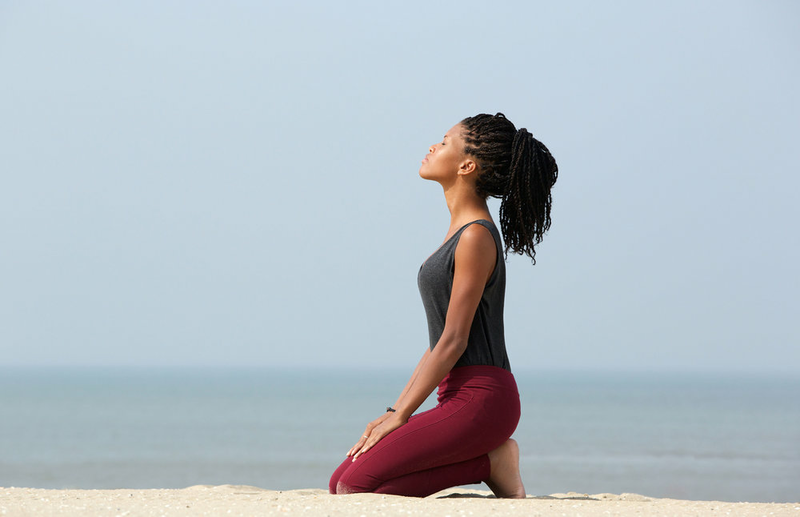 Practicing meditation and yoga not only helped me feel less stressed and overwhelmed, they also helped me to live in the moment, go with the flow, and just become more joyful and positive overall. Doing these three things regularly – meditating, yoga, and taking care of myself – literally Changed. My. Life. And because I continue to reap the benefits of these practices, I want to share them with other women like me. Women who are overwhelmed and stressed by their day-to-day lives, are tired of feeling the way they do, and are ready for a change. Women like you. My mission is to inspire and teach you how to stress less and create calm so you can live happier and healthier. Yes, stress is something we all have to deal with; however, I believe it's possible to lessen, manage, or eliminate it so you can actually enjoy your life. It's possible to be peaceful, happy, and fulfilled more often than not, and I believe we all deserve to live that way. Don't you agree? Calm Coach Jamie Fleming-Dixon works with women who are tired of being burned out, stressed out, and worn out. She teaches them how to create calm so they can be happier and healthier women. 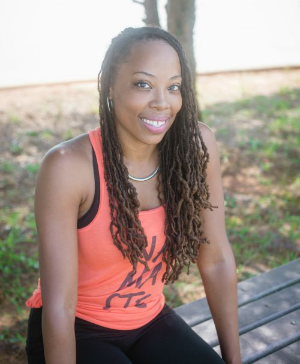 Jamie’s love of meditation and yoga was sparked after giving birth to her daughter, Nailah, in 2013. Her mission is to teach women how to use calming techniques so they can enjoy life again.